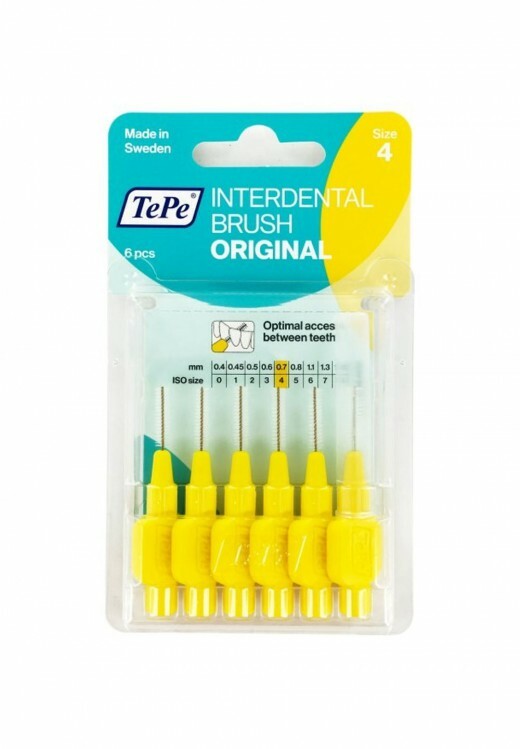 Tepe Interdental Brush Yellow 0.7 is specifically designed to clean the gap or space between the teeth and also, the hard-to-reach areas of the teeth. Use of these specially-designed metal wire brushes effectively cleans the teeth and reduces plaque build-up and helps prevention of tooth decay, gum related issues and bad breath. The interdental brushes are plastic coated to permit worry-free use in the cleaning of the area around dental fillings of metal and to avoid injury to dental implants. Good cleaning action is helped considerable due to the ergonomic design that affords a very comfortable grip, while the plastic coating ensures the wire does not scratch the tooth surface or dental implants. Each of the eight brushes is colour coded; the yellow brushes are 0.7mm. A plastic travel cap is provided that not only protects the brush when being carried around but helps to extend the handle for better manoeuvrability. You may at first for the frontal mouth, insert the interdental brush right into the gap between your teeth at gum level. Keep turning softly so that you have an easy access and the wire is not unduly traumatized. This ensures longevity of the brush. When you have managed to insert the brush gently, you must start brushing backwards and forwards to dislodge undesirable debris or plaque. It is better to shape the brush head slightly into a curve for accessing the back of your mouth. Do not bend. It is necessary to rinse the brush thoroughly in water after each use. Use daily.